Vincent Blandin is one of two technical inspectors at Volvo CE in Trappes, France. Call him and he will diagnose your machine. Meeting a satisfied client makes his day. Vincent Blandin works as a Business Sales and Technical Controller for Volvo CE – and has been with the company for 14 years. ”I love the real relation with the client and seeing the satisfaction when I can help out,” he smiles. His job is a lot about inspections of the machines that the clients use, and then to give advice and recommendations on what the specific machine needs, in terms of service and new parts. Another thing that really puts a golden lining to his working day is when a customer changes brands to Volvo from something else. This procedure happens from time to time, and Vincent Blandin plays a big role in it. Here, there is great potential. “Let’s say a customer buys Volvo equipment to try something else out than his usual brand. Then, thanks to all our services and what we can do and put in place, that customer continues to buy our equipment and perhaps after a few years buys yet another Volvo machine. That is a great feeling,” says Vincent Blandin as he is preparing his tool set, used on his inspections, at the Volvo CE site in Trappes, just outside Paris. The Machine Doctor. Vincent Blandin working on a diagnose. The customer will receive instant advice. I n Trappes he has a work place in the office, but he rarely sits at his desk. When we meet, he is in the workshop next to the office, preparing for a day out in the field. ”My day is punctuated with meetings with customers and equipment managers to schedule machine maintenance. It goes from technical visits and inspection of the equipment, to on-site intervention to go and see the machine that needs it. Then there is a report with photos, statistics and repair notes for the equipment in question,” says Vincent Blandin. And the inspections are occasions that give Vincent opportunity to do what he really loves about his job: meet the customers and their needs. “I just love the real relation and the follow-ups. After the first meeting and inspection, we always make thorough follow-ups, to make sure that everything is ok with the machine. We never let the customer hang loose, so to speak,” he says. The long days, driving around to different sites where clients keep their machines, can be exhausting. To make up for the busy work day, Vincent Blandin has a recipe: having his private life far away from Paris. How much longer will the undercarriage hold? Vincent Blandin is measuring and giving advice. Vincent Blandin continues to talk as he is preparing the tool set. In just a little while, he will drive over to a customer for a meeting and then for an inspection. 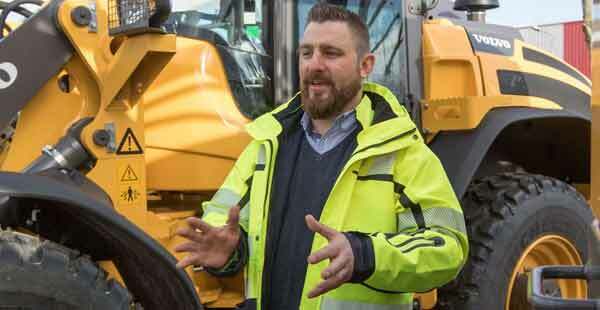 When he started working at Volvo CE, he was a mobile technician for a good ten years, before moving over to after sales control and being a technical controller. After the long work day, Vincent sits in his car to drive home. To use public transportation is rarely an option to him, at least not for the moment. But speaking of the Grand Paris Express project, he does believe that there will be a change. ”I really think that the project will change the Parisians’ life and for all the people that have to go to Paris for work or other activities, especially I think it will change the traffic jams, traffic flow and public transport. I think so and I hope so, for the Parisians' future life,” he concludes and folds his set, ready for a new client meeting.